Publisher: Suzhou Snail Electronics Co. 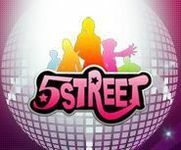 Developer: Suzhou Snail Electronics Co.
"5 Street" is set in a trendy, fashionable surrounding, base on innovative and interactive game concept in a realistic and beautiful background, presenting you a modern and active virtual city! With thousands of individualistic and fashionable clothing match with realistic dance steps, you can show off your unique dance style, and experience the most realistic dancing fun! The 1st casual game in connection with SNS functions by Snail Game. A virtual city of modern atmosphere with fashionable and innovated game design concept. Cutting-edge technology for high-quality graphics. Excellent and stable engine with high efficiency ensures stable game operation. Diverse interactive functions by advanced technology. An extravagant 30-person Dance hall playing the latest in popular music. Gain friendship while dancing in a community site.